With its adventurous geology Grand Canyon attracts millions of visitors every year. The canyon is located in the state of Arizona, USA. The area is popularly known as the “Land of Hualapai” for the native Hualapai Indians. 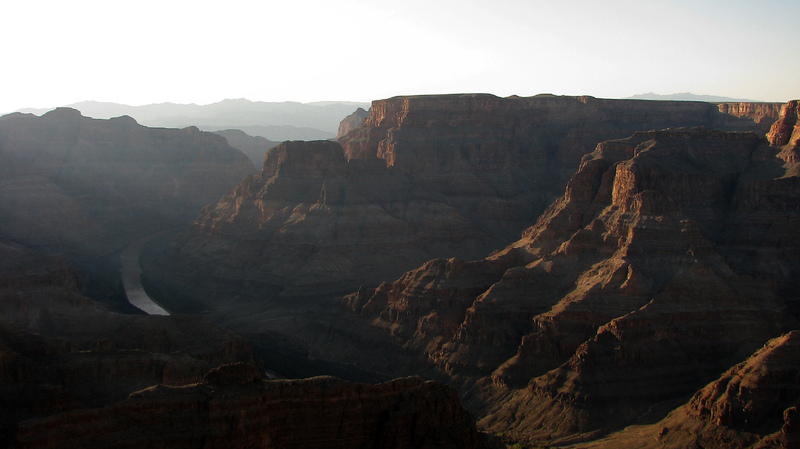 Recent study shows that scientists believe that the canyon was created over a period of seventeen million years. This is one of nature’s most awesome sites. The dramatic formation of the sedimentary rocks stretches as far as the eyes can see. The steep-sided gorge of staggering dimension is cut down in several layers by the heavy force of the Colorado River. The canyon looks marvelous with red, yellow and green rocky layers. In the sunlight the distinctive patterns of shadows and highlights makes the canyon extraordinarily beautiful. The presence of the muddy Colorado River completes the picture. Though the formation of these giant rocks started millions of years ago, even today this startling panorama of Grand Canyon continues to evolve. The picture is qlikd in the Personal mode with neutral lights. The sun raise from the left forms its ways through the rocks and falls on the other side of the reddish rocks. In photoshop the Levels option is used to balance the tonal quality of the picture and the Unsharp Mask option is used to define the details in the rocks. This is one place I want to visit in my lifetime. Nice Qlik. I swear.. it is an amazing place.. specially for the photographers.. u must go! !